The Farberware Affiniti 12 piece set includes saucepans in 1, 1 1/2, and 3 quart sizes plus lids; a 6 quart covered stockpot; 10 and 11 inch skillets; a slotted spoon and slotted turner; and an 11 inch Affiniti square griddle. The exteriors are metal flake porcelain and the nonstick interiors are special Teflon Professional with Metal Guard, making them safe for metal utensils. The handles of the pans are riveted securely, silicone covered for comfort in handling, and they are oven safe to 400 degrees. The Affiniti set carries a lifetime limited warranty. 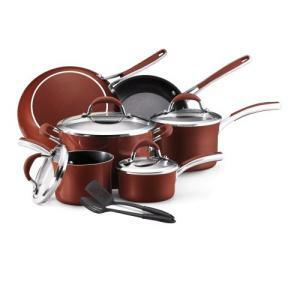 Sets such as this one are an economical way to purchase all of the most needed items for basic kitchen cookware use. The porcelain exteriors of the Affiniti pans come in a new and rich array of colors. Nonstick performance and you can use your metal tools? It sounds almost too good to be true. Considering the dangers of overheating porcelain exteriors on a glass or ceramic stovetop, if you have one, you may wish to consider a look toward the Farberware Millennium set, which offers almost the same grouping of pans (the few differences in size include slightly smaller skillets, a larger stockpot, and a 2 quart instead of 3 quart saucepan with the Millennium collection). They are quite different pans when it comes to construction: aluminum and stainless steel without the Affiniti nonstick interiors. Both sets offer quality pans. Your choice comes down to which features best suit your needs and please your senses. If you want that pop of color in your kitchen and the slightly more generous sizes in some of the most used items in the set, the Affiniti will be sure to please. Here's another Farberware non-stick cookware set to consider.